Make Your Way 2 Chatelherault is an arts and heritage project aimed at getting people walking and cycling more across Lanarkshire, being delivered by icecream architecture on behalf of Clyde and Avon Landscape Partnership. We are currently seeking expressions of interest from Artists / Designers / Makers who would be interested in undertaking a creative research / residency as part of Make Your Way 2 Chatelherault. The commission would involve research and community engagement through workshop delivery exploring themes of heritage and nature. It is intended that the residency process will contribute in terms of ideas and inspiration to the design of 17 wayfinding installations which will be sited across 6 new access routes into Chatelherault Country Park for communities living in Hamilton, Larkhall and Quarter. The commission is divided into 6 parts (each part is a separate set of sites along 1 of the 6 routes.) We are inviting artists to apply for any number of these parts, from one to all - according to capacity. We anticipate appointing 2 - 3 artists in total working on 2 - 3 routes each. Route 1. HAMILTON Walking / Cycling Gateway: Barncluth Road to Chatelherault entrance at Dukes Monument. Route 2. HAMILTON Walking / Cycling Gateway: South Haugh entrance to Chatelherault via Old Avon Bridge. Route 3. 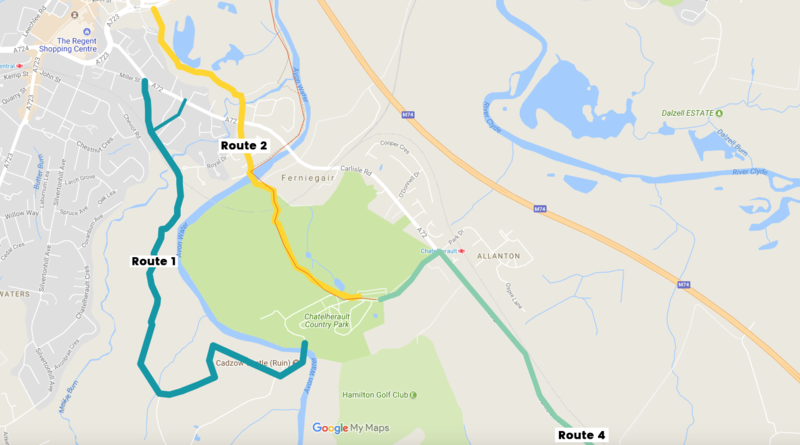 QUARTER Walking / Cycling / Commuter Route: Quarter to Chatelherault. Route 4. 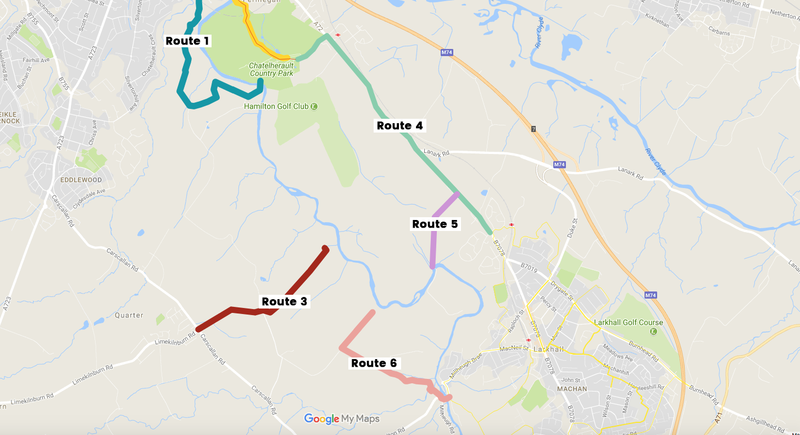 LARKHALL Cycle / Commuter Route: North Larkhall/Merryton to Chatelherault – along National Cycle Route 74. Route 5. LARKHALL Walking Route: Merryton to Chatelherault Park entrance at Fairholm bridge. Route 6. LARKHALL Leisure Cycle Route: Morgan Glen at Millheugh to Sunnyside entrance to Chatelherault Park. November 2017 - Each artist matched with route/s and a local group (this may be a school, club or other organisation). The artist/s will be expected to undertake some personal research into an identified theme. ICA will share suggested themes on appointment. November/December 2017 - The artist/s will plan, prepare and deliver 2 x half-day creative workshops with the group (groups are pre-selected). December 2017 - Artist/s participate in a ½ day idea generating workshop with icecream architecture, feeding back on the research and identifying key ideas or points of interest important for the wayfinding design. Jan/February 2018 - Delivery of a small public activity or event (such as a led walk / talk / meal / temporary installation) directly connected to the route. March 2018 - Artist/s would contribute to the final project exhibition and the CAVLP Virtual Museum. Artists can apply to work on 1 or more routes but must be able to commit to the minimum number of workshops per route. There is a small amount of additional expenses towards the production / printing of any materials for the final project exhibition. Please make it clear how many routes you are interested in applying for. To apply please send a cover letter stating what your interest in the project would be and the kind of approach you would be keen to take (max. 2 x A4 pages). (For example include reference to any particular mediums or themes you may be interested in exploring). Please detail any relevant examples of similar work you have undertaken. If you have a connection to the local area (Hamilton / Larkhall) please let us know. Please state whether or not you hold a current Disclosure Scotland and Public Liability Insurance.